James Bullard and Emily Wilson are bold people. Every October they invite everyone they know to join their version of Oktoberfest. Yes: everyone they know. More than 100 people stop by their San Francisco house during the six-hour event, where they find a keg, coolers of soft drinks and more beer, a table laden with potluck offerings of salads and side dishes, a kitchen counter covered with buns and condiments, and a grill full of sausage. Bullard’s grilling adventures are not limited to sausage. One year he threw big chunks of salt-encrusted beef on the grill, Brazilian-style. Another year he grilled a whole slab of bacon. But there’s always lots of sausage, and there’s always plenty of beer. And if anyone goes home hungry, it’s not because of any lack of hospitality on Bullard and Wilson’s part. The party, now in its eighth year, is a real lesson in entertaining: The kitchen is small, the grill is smaller, and the yard is postage stamp-size. It is also a daunting climb down a steep set of stairs from the kitchen door. The space is not particularly well suited to hosting a huge party―indoors or out. But the generous spirit with which the gathering is thrown pulls even the most timid into the swing of things. As Bullard keeps the sausage supply steady, Wilson makes sure every guest meets someone new. The crowd spreads throughout the house and garden. Since the party usually falls during the pennant race, one group congregates around the television in the bedroom upstairs, watching the baseball game and sending out emissaries for food and drink. Older guests tend to sit in the comparative calm of the living room. But most people meander between the dining room and the yard, carrying food to and from the grill, fetching another beer or more salad, bumping into old Oktoberfest acquaintances, and making new friends. Although they like the coziness of having the party at home, Bullard and Wilson have also hosted the event in Golden Gate Park, where Ultimate Frisbee and other field games were part of the fun. The wild play is now limited to the kids―who scamper through the rose garden, climb the apple trees, and swarm leaping and diving into a front room that Wilson lines with futons and pillows―but the party has kept its raucous feel. To follow Bullard and Wilson’s example, simply buy an absurd amount of sausages and beer, send out an email to everyone you know, and hold on for the ride. Or you can cook several of the sausages and/or grill a chicken for a smaller group but in a similar spirit. Any of the following sides or salads―inspired by dishes their guests bring―would be a welcome addition to a fall potluck. Bullard simmers his sausages in beer first, which makes for quick grilling and helps feed guests fast. We love these smeared with coarse-grain mustard on crusty rolls. The onions take on a lot of the ale’s flavor, including its slight bitterness. Leave them off your sausage if you’re sensitive to bitter flavors. 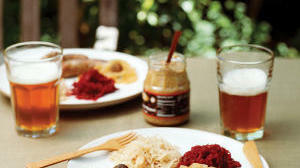 Caraway seeds, onion, and ale transform the humble condiment of jarred sauerkraut into a stellar side dish. It’s good on a bun with a beer-cooked sausage or simply on its own, by the forkful. These potatoes are rich and savory and particularly delicious when eaten alongside beer-cooked sausages. This tangy salad adds zip―and lots of vitamin A―to any picnic or barbecue. Any beets would be delicious here, but we prefer the deep color of red beets with the rest of the menu. Roasting the beets before grating intensifies their flavor and is an easy, relatively mess-free way to cook them. Part chewy molasses cookie, part homey chocolate chip cookie, part spicy gingersnap: These cookies―inspired by ones brought annually by an Oktoberfest guest―have it all. The Sunset staff ate our test batches as quickly as we could bake them.